Much to the surprise of theological weather forecasters, Hell froze over on October 16, 2003. This unexpected development seems closely tied to Apple’s release of iTunes for Windows. The free application, which has the look and feel (within the limits of Windows) of Apple’s famed iTunes music jukebox software, came bundled with QuickTime for Windows, and fully equipped to preview and purchase songs from the iTunes Music Store. 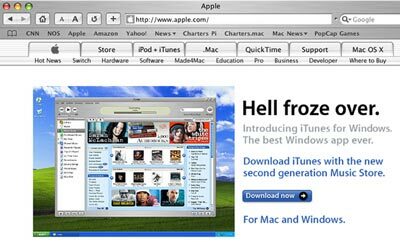 Over the next three days, over a million copies of iTunes for Windows were downloaded from Apple’s site, and over a million songs were purchased from the iTunes Music Store. Meteorological reports from Hell indicate a gradual thaw for the next few days after the Chicago Cubs and Boston Red Sox failed to make the World Series, though they gave it a good try. 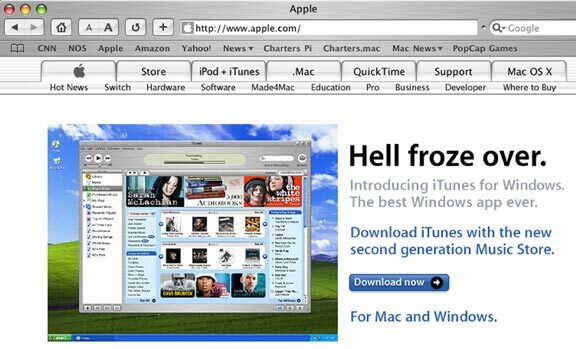 Things got quite a bit chillier again on October 24, 2003, with the release of Mac OS X 10.3, code name Panther. With the ability to seamlessly work within a Windows network, or seamlessly provide services to Windows users on a Macintosh network, the new operating system is sending chills down the backs of network managers everywhere.